In 2015, we received funding through the City of Edmonton’s Neighbourhood Action Program to launch a greening project to make Old Strathcona a greener place. Together with our partner organizations, we brought composters and rain barrels to residents who wouldn’t be able to afford them otherwise, or who aren’t familiar enough with them to use them yet. 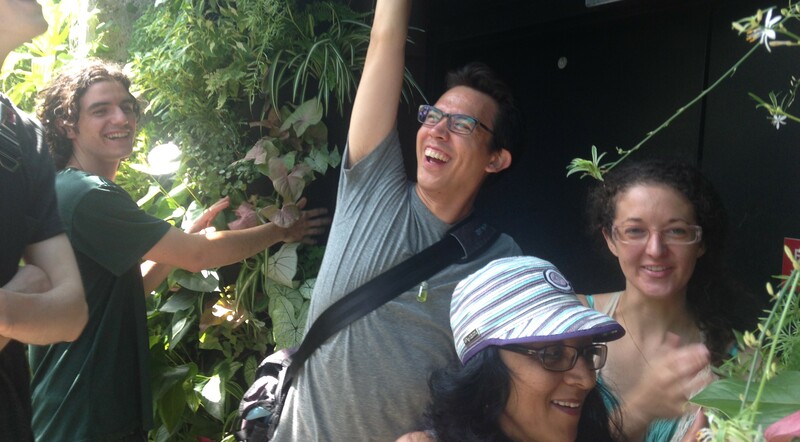 We also invited community members to help build a living wall inside the Roots on Whyte building. Our campaign had two purposes: first, to acquaint the community with information on how our actions can impact the environment. Composting and watering your garden with a rain barrel can help you reduce your greenhouse gas emissions and save on water consumption. Living walls can improve indoor air quality and give you a chance to learn about the plants around us. Second, by distributing these projects throughout the neighbourhood and leading a tour of them, we wanted to encourage others to try them out too. Thanks to everyone who picked up a rain barrel and became a Water Warrior, started using a composter and became a Mulch Master, and joined us in building a living wall to become a Garden Guru. Our partners for this project were the City of Edmonton, Rotary Club of Edmonton Whyte Avenue, Roots on Whyte, and Axis Mundi Artistry.